I recently came across the new company Wild Source Apothecary via the rabbit hole of Instagram and really dig their ethos, ingredients + aesthetic. All the products are natural, organically sourced and bottled in recycled glass. I've been using the Radiance Mask and Hot Cleansing Oil for the last two weeks and my skin is very happy for it. The brand's founder, Kate, answered some questions about starting her own business and why rituals have more impact than routines. 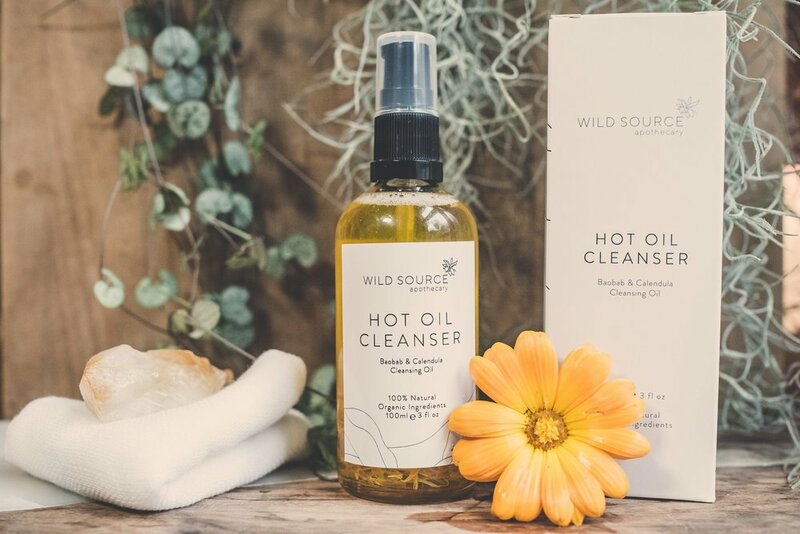 Hot Oil Cleanser by Wild Source Apothecary is made from Calendula and Baobab. Q: Could you describe your journey from studying aromatherapy and blending into creating Wild Source Apothecary? A: I have always had problematic skin; really sensitive, dry but oily and prone to breakouts. The only products that worked for me were really basic, naturally made and with no chemicals, which I loved but they didn't feel special. The packaging was boring - nobody had thought about the experience around buying into a specially made natural product that really worked. So it was either really expensive luxury products that were un-affordable but with beautiful packaging that irritated my skin or natural products that looked really homemade and the packaging did nothing for me. I’d always been interested in the power of essential oils and amazed at their uses so started testing out blending my own facial oils and products to use (that’s where Miracle Skin Oil was born). They worked so well for my skin and when I started giving them out as Christmas and birthday presents I was getting some amazing feedback from family and friends. I decided I would learn the art of aromatherapy and blending. As soon as the course started and after my first few weeks of aromatherapy I knew immediately that all I wanted to do was create organic skincare using the power of botanicals to blend into concentrated formulas. Q: Having just launched here in the UK, what advice would you give to people wanting to start their own business? A: Take your time, that would be my first piece of advice! Get an accountant and don’t buy things you want, only the things you need. Starting Wild Source was the best decision I’ve ever made but it’s not easy. Figure out your direction and stay true to yourself and your own ideas. Once you’ve put yourself out there it can be difficult not to constantly compare yourself to other companies similar to your own. But try to just focus on you and what you’re doing. Be honest with yourself about how much you can take on and let your company grow organically. Work hard, treat others how you’d expect to be treated and trust yourself! Q: You beautifully describe your products as part of a skincare ritual rather than a routine, could you describe the importance of ritual vs routine? A: I think nowadays life has become so fast paced, it’s all about quick turnovers, fast food, fast fashion, getting things done as quickly as possible and in the easiest possible way. Where of course I can see the benefits of this I also think it’s hugely important to slow down, take your time and make some well thought out conscious decisions, especially when it comes to looking after yourself. Rituals not Routines is really about awareness of your body and what you put on it. Knowing what’s in your products and taking pleasure using them. Q: Any book or podcast recommendations? A: 'Women Who Run with the Wolves' by Clarissa Pinkola Estes is an all time favourite that I often re-read. Anything from OSHO always brings me back down to earth. I’m currently reading ‘There’s a Spiritual Solution to Every Problem’ by Dr. Wayne Dyer. New + Full Moon updates + Exclusive offers on readings and workshops. Thank you! For the next 48 hours you can use the code SUBSCRIBED in the checkout to receive 15% off of a reading with me. Copyright Golden Nature + Jules Ferrari 2018. All Rights Reserved.